Myth #1: Electronic and Internet gambling bring revenue to the government to enable more programs. This is only supportable if one takes a “silo” approach to funding. While there is an obvious increase in the revenue to government from these devices, this is more than offset by the social costs. 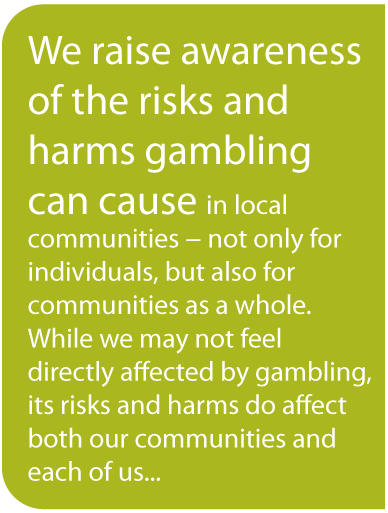 Not only are there extra costs to Social Services and Department of Health in assisting families to deal with the impacts of gambling, but the wider costs to the community are significant (for example, see http://www.gpiatlantic.org/pdf/gambling/gambling.pdf for a detailed cost accounting by GPI Atlantic, funded by the Nova Scotia Gaming Foundation). Myth #2: Gambling devices are not substances and so cannot cause addiction. Research shows that the neurochemical changes that occur in the brains of gambling addicts are the same as in people who are addicted to substances (for further information, see Sunderworth & Milkman , “Behavioral and neurochemical commonalities in addiction” in Contemporary Family Therapy, Vol. 13, #5). Myth #3: Adults can make their own choices about “responsible gambling,” and only those with “addictive personalities” are at risk. Firstly, it has been known for a long time that there is no support in scientific literature for the concept of an “addictive personality” (the following excerpt is from Scientific American, November 1997: “Scientists realize that addictions stem from much more than ‘an addictive personality’ or weak will. The remedies being tested actually target the cascade of neurochemical events at the root of addicts’ cravings”). There are risk factors and protective factors that influence behaviour and outcomes, but these cut across all strata of society. Secondly, and perhaps more importantly, electronic gambling devices are designed based on a deep understanding of human psychology and how to manipulate human behaviour. The psychological principles (such as a variable-ratio reward system) work on all humans as the designers of the machines capitalize on understanding how the brain functions and how motivation and behaviour can be guided. This is done with no disclosure to the public as to the techniques used so that citizens are unable to make an informed choice about their involvement with these devices. Myth #4: Local businesses will suffer or close if electronic gambling is removed from the province. The government program of introducing VLTs into bars and other licensed establishments ends up creating a dependency of the business on these devices, leading them to rely on a business plan/model that is not viable without gambling devices. We need to provide assistance to businesses to restructure their services so that they return to viability without having to use devices that harm their patrons. Myth #5: The government needs gambling revenues in order to be able to offer support to health, recreational and cultural programming. Gambling revenues are effectively a tax on the poor and vulnerable. A government needs to set the tax rate appropriately to fund its programs. Gambling revenues are a smokescreen to fool the public into thinking that their tax rates are lower than they are. We often hear that cutting electronic gambling will cut into health care and cultural programming. This is nonsense. There are many excesses in the provincial budget that could be cut, for example the $175 million recently added to the cabinet-controlled Industrial Expansion Fund (see http://www.cbc.ca/canada/nova-scotia/story/2009/02/17/ns-industrial-fund.html for background information, and see http://www.gameovervlts.com/press/APECRCSept%202005.pdf for an economic critique by the Atlantic Provinces Economic Council: “Gaming Revenues: No Jackpot for the Atlantic Provinces”). Myth #6: If the government does not operate electronic and Internet gambling in the province, the market will be served by illegal and unsafe devices and services operated by organized crime. This is so absurd it is hardly worth debunking. If something is so attractive to organized crime, why is the government leaping to emulate them? By this logic, the government should be distributing crack cocaine and heroin. Should they also be providing licensed hit men so that assassinations are done more humanely? We realize that this is a ridiculous suggestion, but it uses the same logic as the myth! South Carolina banned VLTs in 2000, resulting in 34,000 machines being removed from the state. Even if there are a few illegal machines remaining, the impact is far less damaging than 34,000 legalized machines. Myth #7: This is just games and entertainment – what’s the problem? The euphemism “gaming,” used to describe gambling, inappropriately implies that these activities are entertaining apart from the gambling component. But how long would anyone play a game where they had to press a button over and over to see if pictures end up in a row, if there were no money involved? Perhaps it would keep a five-year-old occupied for ten minutes, but no adult would play such a “game.” There is zero entertainment value to these games apart from the brain-chemistry-altering function of engaging in the risk of gambling. Repetition of this behaviour increases the risk of dependency for all people. Corner-store workers have described customers who purchase scratch tickets and only scratch the bar code for scanning to see if they won. There is no game! Nothing that you can do can change the chance of winning, so why “play”? The product is based on deception. Myth #8: The practice is well-regulated in Nova Scotia, and so it is safe. Myth #9: Electronic gambling is safe because it is provided only in licensed establishments, not in corner stores, etc. It is important to limit exposure of children to these machines. However, does it really make sense to locate addictive gambling machines in places where people are drinking? The first impact of consuming alcohol is to impair judgement. This environment increases the risk factors for those using the machines. Myth #10: We have a cabinet minister overseeing gambling in Nova Scotia to ensure appropriate use, so it must be safe. While it is true that there is oversight of gambling activities at the cabinet level, an inherent problem arises when the government is both the beneficiary of the revenue from gambling, and also its regulator. This could be seen as a potential conflict of interest.